(TORONTO, ON – May 16, 2013) The sophisticated new Lexus IS comes to Canada this summer. Redesigned with passion from grille to tail-lights, the 2014 Lexus IS luxury sport sedan features an all-new, bolder design, dynamic handling and performance, and a host of new luxurious standard features. With that, buyers have a choice of engine sizes and rear-wheel-drive or all-wheel-drive models, intuitive controls and instrumentation, advanced safety features, and thoughtful, driver-focussed convenience and luxury. And all of this is offered to Canadian drivers – seeking a fresh interpretation of luxury – at a manufacturer’s suggested price starting at just $37,300. Both engines offered in rear-wheel-drive and all-wheel-drive models. New steering and rear suspension, inspired by the Lexus GS, deliver exceptional handling. Bold exterior design highlighted by distinct interpretation of Lexus signature Spindle Grille with unique LED Daytime Running Light treatment. New driver-focused, ergonomic interior features lower driver position for improved comfort and driving experience. New available 60/40 split folding rear seats for cargo-carrying versatility. F SPORT packages – inspired by the LFA and track tested at the Nürbürgring are the first Lexus to adopt optional G-AI control, actively matching gear changes to G-forces generated during cornering. 3.5 litre, rear-wheel drive IS F SPORT models are now equipped with the 8-speed, Sport Direct Shift (SPDS) automatic transmission from the acclaimed IS F.
F SPORT models also feature special interior and exterior styling and performance enhancements, including unique seats designed to combine lightweight comfort with outstanding lateral holding performance. Luxury appointments include the Lexus analogue clock, and first Lexus use of electrostatic switches. A host of new standard items for 2014 include boldy-inset LED Daytime Running Lights, premium NuLuxe seat surfaces with eight-way power-adjustable and heated driver and front passenger sport seats, user-selectable drive modes, HID headlamps with headlamp washers, Lexus Display Audio and more. This combination of new standard equipment is unmatched by any competitor in its class. And with a suggested retail price starting from $37,300, this unrivaled level of standard equipment represents substantial value. F SPORT packages enhance the IS with specially-tuned suspension systems plus many unique F SPORT details, including a unique front fascia with mesh spindle grille, distinctive LFA-inspired 18-inch aluminum alloy wheels, sport front seats with lightweight NuLuxe seat surfaces, perforated leather-wrapped steering wheel and shift knob, interior trim, aluminum doorsill trim, and more. IS 350 models are powered by a 306 peak horsepower 3.5L V6, while IS 250 models feature a 204 peak horsepower 2.5L V6. Both direct-injection engines are enhanced with dual variable valve timing with intelligence, electronic throttle control systems, and more. The Lexus IS 250 RWD (starting MSRP $37,300) is available in five packages, including two F SPORT packages (starting MSRP $40,300). The Lexus IS 250 AWD (starting MSRP $39,900) is available in six packages, including three F SPORT packages (starting MSRP $42,900). The Lexus IS 350 RWD (starting MSRP $44,500) is available in four packages, including two F SPORT packages (starting MSRP $45,650). The Lexus IS 350 AWD (starting MSRP $44,000) is available in seven packages, including three F SPORT packages (starting MSRP $47,500). All models feature luxury amenities and performance enhancements, including: Vehicle Dynamics Integrated Management (VDIM); dual-zone automatic climate control; an eight-speaker Lexus premium audio system with satellite radio, USB audio input, Bluetooth® connectivity and steering wheel-mounted audio controls; electro-chromatic rear view mirror; power windows with water repellant front door glass; leather-wrapped steering wheel with paddle shifters; Lexus SmartAccess key system with Push Button Start/Stop; integrated garage door opener; eight airbags, an onboard first aid kit, six active safety technologies including Vehicle Stability Control, Traction Control and Electronic Brakeforce Distribution, and other safety features; auto-leveling HID headlamps; dual power remote heated exterior mirrors; and more. 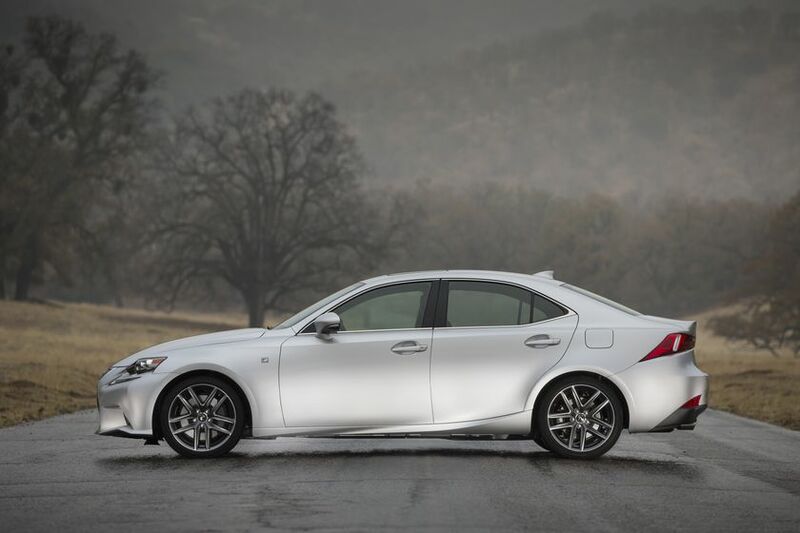 To preview the new 2014 Lexus IS, visit lexus.ca. Lexus in Canada is the exclusive Canadian distributor of Lexus luxury cars and sport utility vehicles through a sales and service network of 37 dealers across Canada. With 13 Lexus models on the road today, five of them being hybrids, Lexus has the largest luxury hybrid lineup; allowing guests a choice in a large range of luxury vehicle segments.